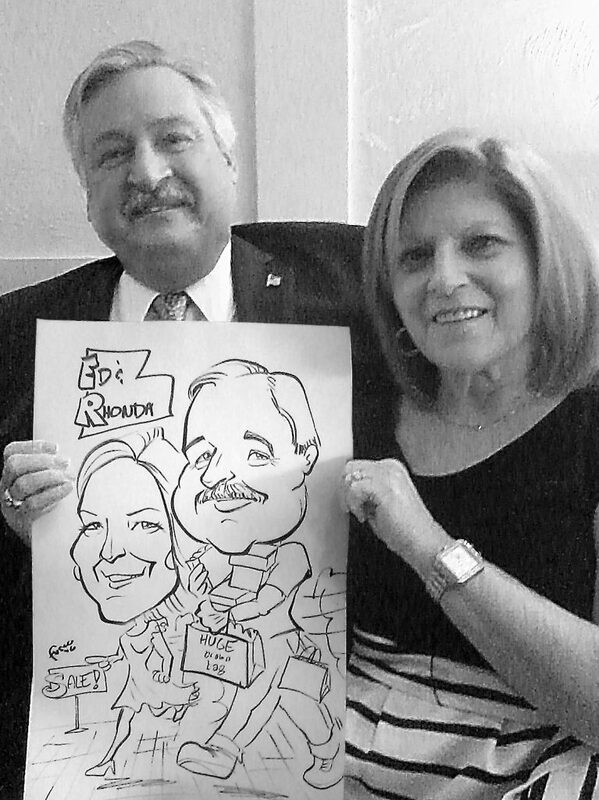 This couple was drawn at The Stone House at Clove Lakes, a beautiful venue in Staten Island. 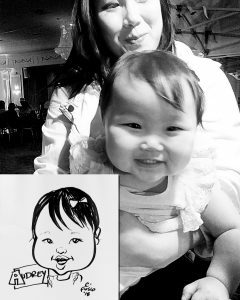 It was a first birthday for twins – I wish I had gotten a photo of the twins’ drawing, it was so cute! But they were being passed around from grandma to auntie to cousin, so I didn’t get a chance. Ah well, Josh and Gizela were cute, too! 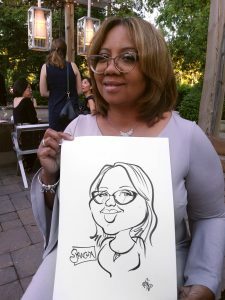 The Blue Studios Caricatures feature Christine, aka The Kindest Caricature Artist in NJ! No mean exaggerations here, just perfect likenesses that are perfect for elegant affairs… or sensitive teens. Based in Green Brook, NJ. Please note that there is a travel fee for Staten Island. 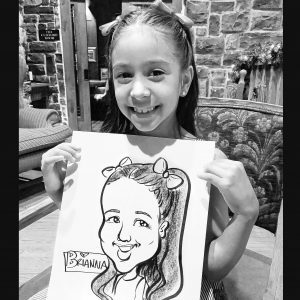 I drew this little darling at a holiday party in Ringos, NJ. This is my third year in a row drawing at this company’s celebration. 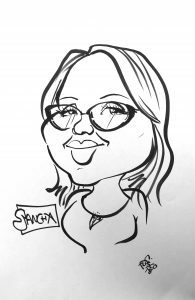 Back at Kean University, this time drawing caricatures for Homecoming. It’s always a pleasure drawing for Kean and they’re only about 20 minutes away. 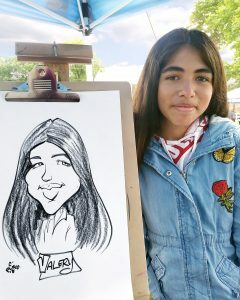 This adorable young miss fussed during her whole caricature, so I had to fudge the smile. 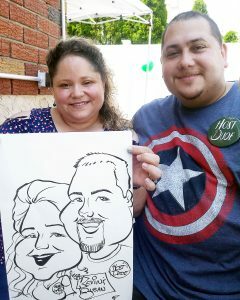 It’s the kind of thing that isn’t hard after drawing caricatures for 20 years! When I was done, though, her face lit up like a light bulb and everyone around went SQUEE!!! These hilarious hosts were drawn at a very unique party honoring the wife’s 60th birthday, the husband’s 70th birthday, and their 20th wedding anniversary! 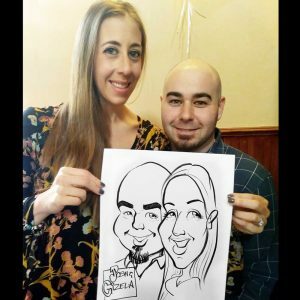 4-hour minimum for caricaturing services in Staten Island. Black & white custom bodies. All rights reserved. “Help me, Rhonda!” Here’s a sample of my work featuring full custom bodies. It takes a little longer, but people get a kick out of choosing their own scenarios, such as this shopping scene. Frank and Claire were quite the entertaining couple! 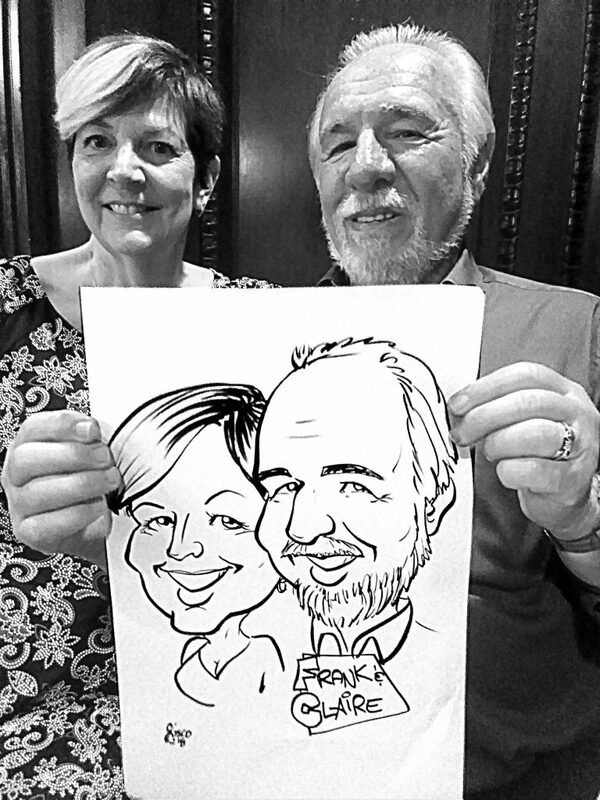 I drew them at an elegant first communion party that was held at the Madison Hotel in Morristown, NJ. 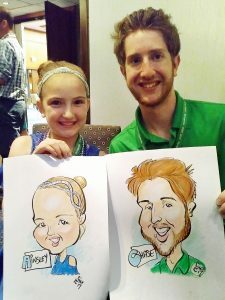 Ainsley and Chase were a brother and sister duo who cracked me up at their parents’ company party. Oooh, a special treat for you all today! These kind and obliging guests at this elegant Princeton wedding were nice enough to take a video and send it to me. I hope you enjoy seeing me work.